The pinnacle of art, culture, tradition, spirituality and architecture come together as a beautiful monument of worship in the Meenakshi Sundareshwarar Temple in Madurai in Tamil Nadu, India. Located in the heart of the city, the temple is a prime example of the extraordinary expressions of human talents in the ancient places of worship. The Meenakshi Sundareshwarar Temple is dedicated to the worship of Goddess Meenakshi & Lord Sundareshwarar, who were the incarnations of Goddess Shakti and Lord Shiva themselves. Goddess Meenakshi was born to the Pandyan king Malayadhwaja Pandya and his wife Kanchanamalai after their intense prayers to the gods offered in the form of a putra kameshti yajna (sacrifice for a child). The baby girl emerged from the holy fire of the yajna kunda itself, with three breasts and a divine voice told the king not to worry, as the third breast would disappear when the girl meets her husband. The girl child, named Tadaatagai was trained in all the 64 shastras (fields of science) and grew up to be a great warrior princess. She conquered many lands, and reached Mount Kailash, the abode of Lord Shiva. Here, when she saw Lord Shiva himself, in the divine form of Lord Sundareshwarar, her third breast disappeared and she fell in love with him. Their divine marriage and subsequent coronation took place when they returned to Madurai, the capital city of the Pandyan empire. Goddess Meenakshi was a great administrator and she ruled over her kingdom for many years. The deities installed in the Meenakshi temple, were given by Goddess Meenakshi and Lord Sundareshwarar themselves, as energized deities for worship by all and sundry. The temple has become an embodiment of their divine energy and a visit to the temple raises one to a higher conscious level, simply by imbibing the divine energy in the temple. 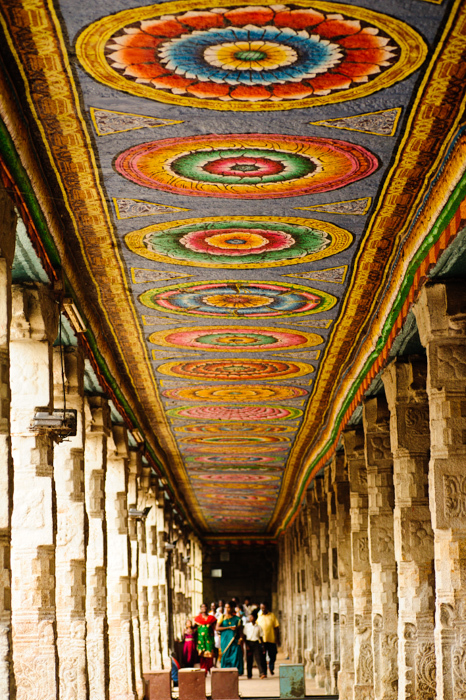 The temple is a magnificent work of Dravidian art and architecture. It is richly embellished with frescoes, depicting scenes from Meenakshi’s life, and elaborate carvings, of the different divine forms of the many gods and goddesses. The Hall of Thousand Pillars has thousand carved pillars. The temple itself has four main entrances located in the four cardinal directions, marked by huge gopurams, the tallest one 170 ft high. The gopurams are richly carved and depict scenes from many different vedic legends and puranas. The main shrines are adorned with vimanas, or towers which are also minutely carved. The glory of the temple and the vedic tradition had started to decline around the 6th century AD. At this time, Saint Tiru Jnanasambandar , along with three other prominent visionary saints revived the Shaiva tradition through a revolutionary bhakti (devotion) movement centered around the temple town of Madurai in the Pandya Kingdom. Tiru Jnanasambandar was one of the 63 Nayanars, Tamil Saiva Tradition Saints, and enlightened devotees of Lord Shiva who lived around the 6th century CE in South India. He stood up against the pseudo Jain forces which were overpowering the Shaiva Tradition in the South Indian kingdoms at that time and revived the Shaiva tradition, returning the glory and respect to the temple. His spontaneous contribution to the Tamil compositions ‘Tirumurai’ forms the scriptural basis of the Shaiva Tradition. The Meenakshi Sundareshwarar Temple is a standing testimony to the spiritual strength of truth and the triumph of truth over evil forces. It is not only a temple, but also a mark of the victory of divine powers over evil, and is a reminder to one and all that Meenakshi & Sundareshwarar are not mere deities in the temple, but rather, are eternally ruling and watching over their kingdom, from the temple. Why do We do Guru Pooja?